We develop a unique computational modeling methodology for patient-specific computational hemodynamics (PSCH) based on CT/MRI angiographies and Doppler Ultrasound (DU) records from clinical evaluation. Our method integrates a simplified Lattice Boltzmann model (SLBM) for anatomical extraction and a volumetric LBM (VLBM) for hemodynamics into a unified PSCH computing platform. 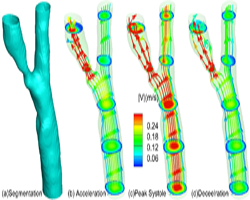 The patient-specific artery geometry and the accurate volumetric boundary information are obtained from the SLBM and seamlessly fed into the VLBM. The data models and algorithms are inherently parallel and ideally suited for GPU acceleration to achieve high computational efficiency. Validation studies are conducted on both patient-specific aortic and carotid arteries. Flow structure, vorticity information, and wall shear stress distribution are revealed in steady and pulsatile flow conditions. The benefits are (1) no explicit data reconstruction and mesh generation are needed avoiding extra computational cost and inaccuracy; (2) explicit algorithm and local data access of mesoscale modeling makes our model immediately amenable for parallel acceleration over GPUs achieving fast performance. The unified computing platform will (1) enable secondary analysis of existing medical images from clinic via massive PSCH and parametric analysis aimed to identify unprecedented hemodynamic indicators for clinical assessment and prediction of fatal cardiovascular diseases such as stroke and heart attack and (2) facilitate access of medical practitioners to the quantitative flow information in diseased arteries simultaneously with CT/MRI imaging for lesion diagnose and assessment. This work is under International Patent Number: WO/2016/065161, ``Unified Computational Method and System for Patient Specific Hemodynamics''. We are looking for collaborators who would like to work together on or commercialize the system. 1. Using flow feature to extract pulsatile blood flow from 4D flow MRI images, Zhiqiang Wang, Ye Zhao, Whitney Yu, Xi Chen, Chen Lin, Stephen F. Kralik, SPIE Medical Imaging Conference, To appear, Orlando, Feb, 2017. 4. A GPU accelerated lattice Boltzmann simulation for rotational turbulence. Huidan Yu, Rou Chen, Zhi Yuan, Ye Zhao, Yiran An, Yousheng Xu, Luoding Zhu, Computers and Mathematics with Applications, 67(2), 445-451, Feb., 2014, Elsevier (Lnk). 7. Lattice Boltzmann based PDE solver on the GPU. Ye Zhao, The Visual Computer, volume 24, number 5, pages 323-333, Springer, May, 2008 (PDF).